The Tree of Life Version is a wonderful Bible translation for Messianic and Hebrew Roots believers. It is produced by a team of both Messianic Jewish and Christian scholars and is based on a rich understanding of the Hebraic roots of the faith held by first century followers of Yeshua the Messiah (Jesus Christ). As I write this, I am in my second time reading the Tree of Life Version (TLV) all the way through from beginning to end, Genesis to Revelation. Yes, this Bible maintains the familiar English translation of the names of the books and won’t be awkward or confusing for readers who are more interested in comprehending what the Bible says than impressing someone with Hebrew words. That’s not to say you won’t find Hebrew words in the TLV, but it doesn’t go overboard and always uses them with a purpose. 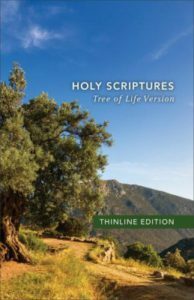 The Tree of Life Version is published by Baker Books and the Tree of Life Bible Society, formerly the Messianic Jewish Family Bible Society. According to their web site, a team of “70 Messianic Jewish scholars and friends” contributed to the translation project. 70 is a good number – the number of the nations, and the number (OK, actually 72) of scholars involved in translating the Septuagint, the first major translation of the Hebrew Bible out of Hebrew. More than 30 members of the TLV team are listed with their pictures and short bios, and among them are some names many of us would recognize. Here are a few of them and places where you may have heard of them, although their credentials go way beyond the few things I mention here. One of the key elements of the Tree of Life Version is that the translators come from solid Biblical backgrounds but with a range of viewpoints on secondary issues. This helps to safeguard the translation from unnecessary doctrinal bias while allowing the Jewishness of the text to come out. The fact that the list of translators and contributors is fully public demonstrates this commitment, unlike some other popular Messianic Bibles. TLV Bible Society lists 16 key principles that guide the translation. I won’t list all of them here, but of those, nine of them begin with the word “Restoring…” and four more with the words “Clear up…” This gives you a pretty good idea of the goal of the TLV. The first key principle is “Restoring the Jewish Name of the Messiah.” In the TLV, you will read Yeshua rather than Jesus. The TLV translators have chosen to use the Hebrew name in place of the English name where the Greek says ιησους Iesous. The Greek word χριστου Christos is translated as Messiah. The second key principle is aimed at “Restoring reverence for the four-letter unspoken name of יהוה God,” often called the Tetragrammaton which is really a Greek term. The important word is reverence, not pronunciation. Keeping with both Jewish and Christian tradition, it isn’t translated but rather substituted with the word ADONAI. This is easily recognized if you choose to pronounce the name in some way. An interesting choice is to translate אלהים Elohim as the English word “God” except when the text says יהוה אלהים Yahweh Elohim, in which case the TLV says ADONAI Elohim (most English translations use LORD God). I’m not sure why, but they have chosen to render the Shema (Deuteronomy 6:4) as “Hear O Israel, the LORD our God, the LORD is one” and in the footnote put “Shema Israel, ADONAI Eloheinu, ADONAI Echad” rather than follow the aforementioned convention. Following key principle #7, the TLV translates “a few key names in the Biblical text to a more Hebraic expression to add clarity and reconnect Messiah to His Jewish family,” names like Miriam (Mary), Jacob (James) and Judah (Jude). The TLV is consistent with this principle by using Jacob and Judah as the names of the New Covenant letters generally called James and Jude. The books of the Old Testament are in the order of the traditional Hebrew Bible following the Masoretic Text. I find it curious that most English translations use the Masoretic Text for the Old Testament yet place the books in the order of the Septuagint. The Hebrew term is תנך “TNK,” an acronym for Torah (Law) Nevi’im (Prophets) and Ketuvim (Writings) pronounced Tanakh. The TaNaKh is translated from the Hebrew Masoretic Text and ends with the book of 2 Chronicles, the last book of the Ketuvim. The New Testament, or more properly the New Covenant as it is called in the TLV, begins immediately after the end of 2 Chronicles 36. There is no blank page or title page – the “uninspired” page found in most Bibles. In my copy, 2 Chronicles 36:23 is at the bottom of page 906. Matthew 1:1 is at the top of page 907. The New Covenant is translated from the 27th Nestle-Aland Novum Testamente Graece, a text from the Alexandrian family. In my opinion, and I am not a Greek scholar but I do compare a lot of translations, they have done a great job of translating the Greek text. Some Messianic Bibles seem to be so afraid of Greek that they avoid as many Greek terms as possible. But here, for example, in the TLV συναγωγην sunagoge is translated as, well, synagogue – because that is where Jews worshiped in the first century, and still do today. But the TLV is consistent in using certain Hebrew terms in both the TaNaKh and New Covenant writings. These transliterated Hebrew words are shown in italics in the text and are listed in a glossary in the back. Common Hebrew terms you will see include shalom, shofar, matzah, amen, halleluyah, Torah, and Shabbat. The priests are termed kohanim and the high priest is kohen gadol. Children (or sons) of Israel is shown as Bnei-Yisrael. Again I will point out, they don’t go overboard with Hebrew terms. At the time I write this there isn’t a TLV Study Bible (maybe someday), but there are a few very nice reference tools and extras. In the back you will find a listing of the Parashat readings, the division of the Torah (Genesis through Deuteronomy) into 54 portions read on an annual cycle in many Jewish synagogues as well as Messianic congregations. This table does not list haftarah readings (associated readings from the Nevi’im) or New Covenant readings, nor does it include traditional readings for the annual festivals. There are a couple of maps, one titled “Yeshua’s Travels 1st Century Israel,” and one titled “21st Century Israel.” The second one is pretty cool; it has a boundary line around all of modern-day Israel with the boundaries of the Gaza Strip and West Bank territories as dotted lines within Israel. But the Golan Heights aren’t identified separately and are just included in Israel without any dotted lines (as it should be!). Messiah’s Prayer (also known as The Lord’s Prayer) appears to come from the Hebrew New Testament by the Bible Society in Israel, with the added doxology. In the beginning God created the heavens and the earth. Now the earth was chaos and waste, darkness was on the surface of the deep, and the Ruach Elohim was hovering upon the surface of the water. and you will know ADONAI. I will sow her in the land for Myself. I will have compassion on Lo-ruhamah. Hosea 2:21-25 – notice the verse numbering. O God, look at our shield, and look upon the face of Your anointed. is better than a thousand anywhere else. For ADONAI Elohim is a sun and a shield. ADONAI gives grace and glory. Psalms 84:10-13 – notice the verse numbering. In the Psalms when there is a descriptive title, this is usually verse 1 in the Hebrew Bible. Also notice that the Psalms, part of the Ketuvim (writings) come after the book of Hosea in the Nevi’im (Prophets). Jacob, a slave of God and of the Lord Yeshua the Messiah, To the twelve tribes in the Diaspora: Shalom! Consider it all joy, my brethren, when you encounter various trials, knowing that the testing of your faith produces endurance. And let endurance have its perfect work, so that you may be perfect and complete, lacking in nothing. I highly recommend the Tree of Life Version as one of the best Bible translations for Messianic and Hebrew Roots believers.